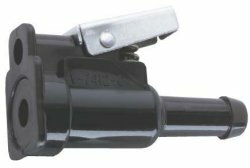 Boatersland Marine > Engine/Mechanical > Fuel System > Fuel Fittings and Barbs > Attwood 88897 Johnson/Evinrude/OMC Fuel Hose Fitting 3/8"
Attwood 88897 Johnson/Evinrude/OMC Fuel Hose Fitting 3/8"
For use on both ends of fuel line to connect tank fitting and motor. Hose barb fits 3/8" I.D. hose. A quick-connect fitting for use with Attwood fuel tank fitting 8883 or similar fittings.